Potting mix or potting soil refers to the media people use to grow vegetables, plants etc in containers. It is generally used as a substitute to the soil for growing plants. Now, why buy a bag of soil, if you have a garden full of it? Because potting mix is no ordinary soil – and your potted plants need something special if they are to grow properly. Coconut coir is generally marketed in the form of compressed bales. Prior to using it, you need to add some water. Coco coir is made of coconut husk. More on this in this article. 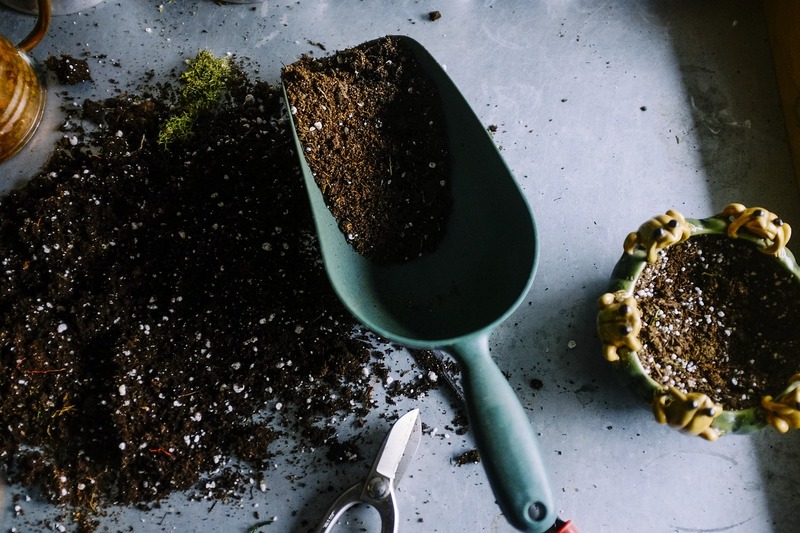 Peat moss used to be the most common type of potting soil, but due to the problems like environmental issues, nowadays its use got reduced a bit. There can be different types of peat moss, the most common is sphagnum peat. Peat moss is not very good for re-wetting. More on peat moss is here. Nowadays most people avoid this media to prepare any potting mix. Though it has more inbuilt organic nutrients than most of other media, the problem is endless. Using soil can increase the total weight of the mix, and make it prone to water logging. Also, normal soil contains weed seeds and pathogens which need to be removed first. It is a very efficient product for using in smaller containers. It is prepared by treating mica. Vermiculite is very light in weight and has a very good water absorption capability. More on vermiculite is here in this article. Perlite is basically volcanic ash. Finer the grain larger its capacity to hold the water. It is neutral to slightly alkaline in nature and is a good way to reduce the acidity of the potting mix. Perlite is dangerous to handle as it’s dust is highly irritating to lungs. Use proper precaution before handling. Interested in Perlite? Find out more in this article. Sand is generally used to increase the porosity of the mix. It also increases the weight of the mix. It is a great ingredient in case you are planning to grow cactus and other succulents. Sometimes wood chips, pine bark etc are also used as an ingredient in the potting mix. 1. good porosity: the best potting soil general has AFP or air-filled porosity range between 10 to 20. Fast absorption of water: It should absorb water pretty fast. lightweight: the Potting mix is used for planting in containers. So it should be light weight so that the shifting of pots can be done very easily. For this purpose in most cases, people use the soilless potting mix. You should select the ingredients which are readily available to you and are not very expensive. Potting mix needs to be weed and Pest free. In most of the cases, it is sterilized. It should also not contain any toxic substances or extra nutrients or salts. The ingredients should be such that you can easily store them. For example, you can store coconut coir in the form of bales, easily for a few years. This type of organic potting soil can go with most of the plants and vegetables. The pH of the mixture is slightly acidic to neutral. Mix coconut coir with perlite or vermiculite in the ratio of 3:1 for this. These type of mix is generally for the plants which love the acidic medium. The ideal mixture would be to add organic matter such as peat moss and perlite or vermiculite in 4:1 ratio. Cactus and other succulents require very good drainage. Due to this reason the potting mix needs to be with extra drainage facility. Add a little bit of sand along with coconut coir and perlite to make a proper mix. For seed-starters, add coconut coir and perlite or vermiculite in 2:1 ratio. Many people prefer peat moss in place of coir. In the case of peat moss, the ratio would be much lower.